The rocket propelled grenade (RPG) is a heavy weapon that fires a rocket far away and explode upon contact with enemies. Carrying such a weapon would reduce the speed of movement of a player while the movement speed during shooting is not further reduced by too much (the pistols have a flexibility advantage of 400% over the RPGs). It has a low to moderate rate of fire but has a long range and comes with explosive damage over an area. This makes it very suitable against a group of mutants that come together and approach from a distance. 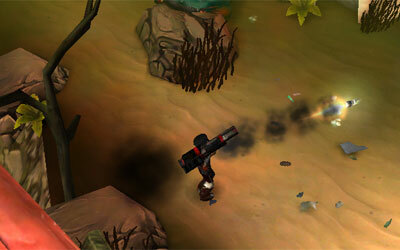 This also works in close range because the user would not take any damage even if the rockets explode nearby. Some experienced users would use it as the primary weapon to run and gun as it is well suited against groups of low health mutants in coop multiplayer. It is sometimes referred to as the "crowd control" weapon.